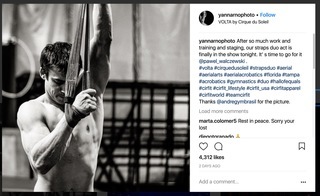 TAMPA, Fla. — Hours before 38-year-old Aerial acrobat Yann Arnaud would fall 20 feet to his death, he posted a picture on Instagram with a message about a new act he would be performing for the first time. "After so much work and training and staging, our straps duo act is finally in the show tonight. It’s time to go for it,” the post reads. The husband and father had spent more than 15 years with the theatrical company, when Saturday night, one of his hands slipped off the double rings during a straps act. According to the Hillsborough County Medical examiner who released Arnaud’s autopsy Tuesday, Arnaud went into cardiac arrest during surgery. His official cause of death is described as basilar skull fractures with contusions and subarachnoid hemorrhages of the brain due to blunt impact to his head and neck. The company canceled its final Sunday Tampa performances of VOLTA, its newest show under the big top. Arnaud’s death is the latest tragedy in the aerial circus world, a world known for turning the risky and unbelievable into jaw-dropping reality. 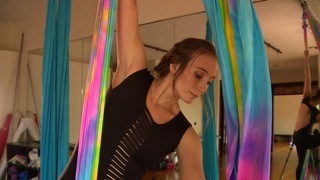 “It is dangerous but is it more or less than some other things we do out there?” asked former aerial acrobat Samantha Mellor. 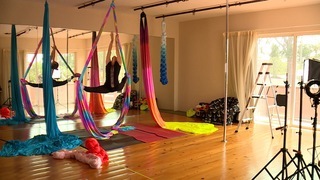 Mellor now runs Sarasota Warrior, an aerial arts and supply studio in Sarasota. “There are people out there who get worried and concerned there should be a net or there should be extra measures taken. I would say, I’m taking the risk and I would be offended if someone forced something on me that I did not want,” she said. OSHA records show over the past 10 years, Cirque du Soleil has been inspected by the state and federal arm of the Occupational Safety & Health Administration (OSHA) just a handful of times. Since 2013 OSHA has issued the company more than $50,000 in fines after two deaths. Yann Arnaud’s death now marks number three for the world-renowned group that consistently raises the bar for aerial acrobats leaving some to wonder if soaring to new heights has become too dangerous. A company spokesperson says they are shocked and saddened by Arnaud’s death and are fully cooperating with authorities while conducting its own investigation. "It is with immense sadness that Cirque du Soleil Entertainment Group reports that a tragic accident occurred March 17, during a performance of its show VOLTA, in Tampa, Florida. While he was performing the aerial straps number, long-time aerialist, Yann Arnaud, fell onto the stage. Emergency procedures were immediately activated and Yann was transported to the nearest hospital, where he later passed away from his injuries. The entire Cirque du Soleil family is in shock and devastated by this tragedy. Yann had been with us for over 15 years and was loved by all who had the chance to know him. Over the coming days and weeks, our focus will be on supporting Yann’s family and our employees, especially the VOLTA team, as we go through these difficult times together," said Daniel Lamarre, President and CEO of Cirque du Soleil Entertainment Group. We are currently gathering more information about this tragic event. We are offering our full and transparent collaboration to the authorities as they look into the circumstances of this accident." From Tampa, the show was scheduled to head to Philadelphia. A company spokesperson says they have not decided yet if that will go on as planned. "The last 2 shows of VOLTA scheduled to perform in Tampa, March 18, at 1:30 p.m. and 4 p.m. were cancelled. All purchases through Cirque du Soleil website or call center will be automatically refunded on the credit card used for the original purchase. For tickets purchased through one of our partners, customers can contact the original point of sale for refund."